Dave McCool started Vinyl Concepts in 1998. Looking for something he could do working from home, he used his experience from the Penn State sign shop to start his own shop. What began as a way to make a little extra spending money grew into a successful part-time business. Still working full-time at Penn State, Dave spends his nights and weekends designing and making signs with the help of his son Tanner. 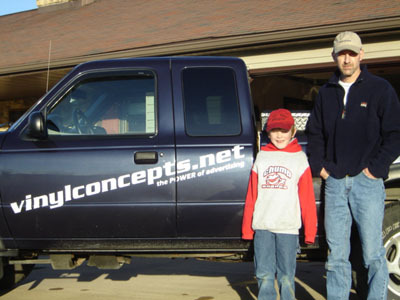 Vinyl Concepts is a computer-aided vinyl cutting business specializing in vinyl lettering, graphics, logos, vehicle lettering, business signs, magnetic signs, license plates and banners. We are a supplier of Gemini Letters offering bronze and aluminum plaques and cast metal and plastic letters that carry a lifetime guarantee. We can build your business image from logo design and also provide business cards, signage, shirts, hats, etc. We want to help your business succeed and ensure complete customer satisfaction in every job we do. It is our belief that advertising doesn’t cost, it pays! Vinyl Concepts serves clientele throughout Central Pennsylvania and as far away as Maryland and California. Please visit our website at www.vinylconcepts.net or call (814) 349-2404. Vinyl Concepts is proud to be a corporate sponsor of the Snow Show Rails to Trails since 2003 and is delighted to be working with such a fine organization.